They're back! And more are coming back as we speak. On Sunday, 09 March 2014, I observed my first noticeable wave of returning Ring-billeds at Whiting Beach in Indiana. I sensed an increase at the Lake County Fairgrounds the day before and so I visited the lakefront to see what changes were taking place. Sure enough, some 250 littered the beach at Whiting, all mostly adults with only one 1st cycle and a handful of 2nd cycles. Compare this to just 50 reported the day before. Adult Ring-billed Gull. Whiting, IN. 09 March 2014. 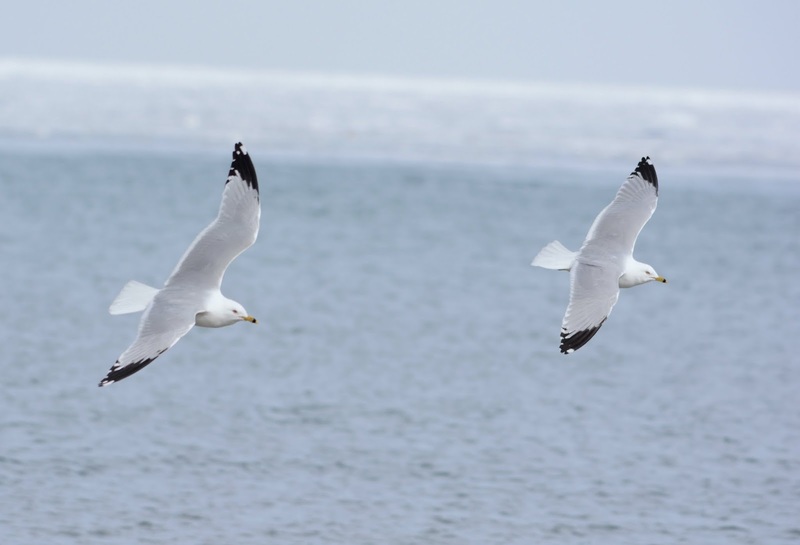 Ring-billed Gull is found in northern Illinois year-round, but decreases in the winter when, presumably, the breeding residents move south and are replaced by populations from northern latitudes. It's not unusual to only see 15-20 Ring-billeds in an entire day of winter gulling at some sites, with 30-50 being average. I'm always amazed by how my perception of this species' size varies depending on the season. 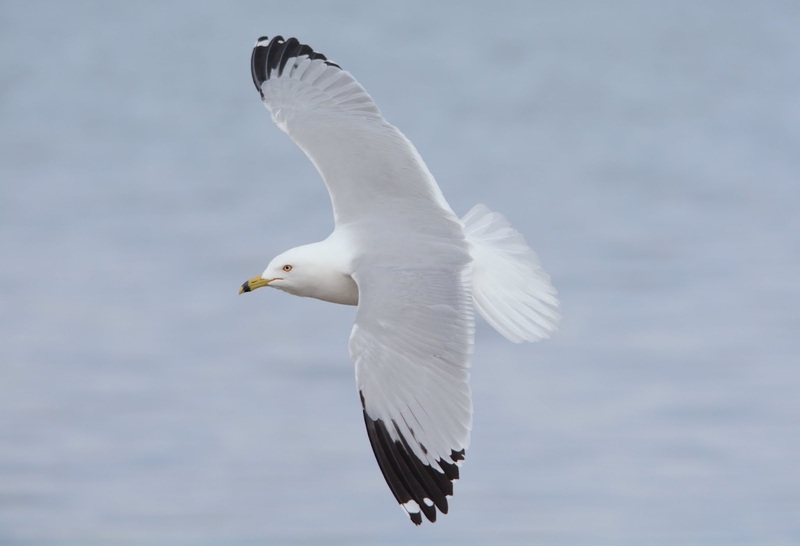 When observing these birds on Sunday, I made a mental note of just how small they are when compared to the larger gulls such as Herring, Lesser Black-backed and Thayer's. After a month or so when our larger gulls move out, this species goes back to looking "big" again, to my mind. At the time, most of the adults have pristine white heads and are in full breeding condition. A small percentage of adults do show light to moderate head streaking. All the 2nd cycles still show head streaking and so their prealternate molts may be later than adults. Why very few 1st and 2nd cycles are around is somewhat of a mystery to me. Are these ages still farther south on the wintering grounds with no urgent need to hurry back to the breeding grounds? 1st Cycle Ring-billed Gull. Whiting, IN. 09 March 2014. One observation I made while watching them feed at my feet is just how similar to Laughing Gull some can sound when "laughing", especially as they land to feed among other feeding birds. Wing structure can look considerably different in flight depending on the bird's thrust and speed. Finally, I got out the next evening to listen for migrating birds, having read reports that they were moving north along major lakes and river-ways south of me. Sure enough, around 8:00 p.m., I began hearing their soft barks and yelps as they flew relatively low over the I-80 and I-57 corridor near the Will-Cook county line. It's said that spring migrants are rarely detected en route and just suddenly appear. I think it takes a little effort, but observable. The migrating flocks seemed to be flying in loose flocks of 2-3 birds and did not seem to be flying unusually fast. It was obvious that their calls were used to communicate with one another as they pushed through. 1st Cycle Ring-billed. Tinley Park, IL. 10 March 2014. 2nd Cycle Ring-billed. Tinley Park, IL. 10 March 2014.